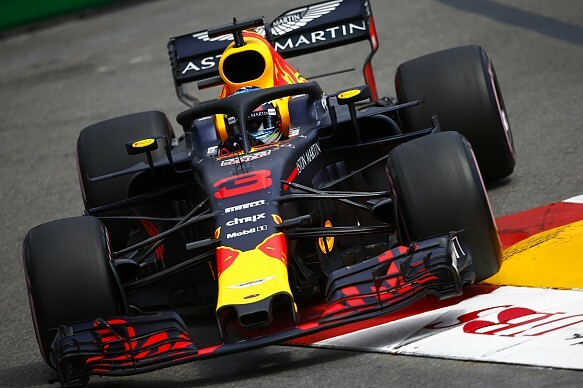 Daniel Ricciardo completed a clean sweep of Thursday practice for the Monaco Grand Prix by topping the second session of the day in another Red Bull one-two. Ricciardo had set the pace in the morning, but it was team-mate Max Verstappen that took top spot 19 minutes into the afternoon session with a lap of 1m12.468s using hypersoft Pirellis. Verstappen eventually worked down to a 1m12.071s on his first set of tyres and was set to improve again when the session was red-flagged after 25 minutes. This was to allow repairs to the track on the run from Casino Square to Mirabeau, with race director Charlie Whiting visiting the scene and some welding work done on what appeared to be a drain cover in the middle of the track. When the session restarted after a 15-minute interruption, Verstappen went out on a fresh set of hypersofts and, like many, struggled with traffic. He improved his time by a slightly to a 1m12.035s, although that run came to an end when he clipped the rear of Romain Grosjean's Haas at the hairpin while letting past Ricciardo and subsequently returned to the pits. Ricciardo opted to complete his qualifying simulation run later than most, eventually hitting the front with a lap of 1m11.841s with 22 minutes remaining. This put him 0.194 seconds ahead of Verstappen, although the Dutchman would have posted a lap of 1m11.765s had he strung his three best sector times together. Sebastian Vettel was third fastest for Ferrari with a time 0.378s off the pace set on his eighth lap using a set of hypersofts. That put him just over a tenth ahead of Lewis Hamilton, who shaded the second Ferrari of Kimi Raikkonen by 0.009s despite a big slide coming through the second part of Swimming Pool. Mercedes driver Valtteri Bottas was sixth, 0.099s slower than Raikkonen, although he was set to post an improved time when he aborted a lap on his performance run and headed into the pits. 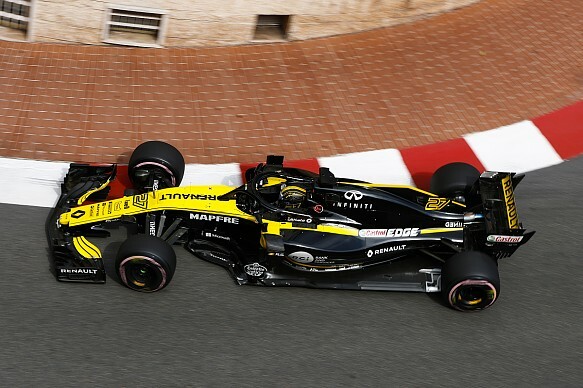 Renault's Nico Hulkenberg was best of the rest in seventh place, his best time set on hypersofts being 1.206s off the pace and just three hundredths faster than McLaren's Stoffel Vandoorne. McLaren left its qualifying simulation runs later than most and both Vandoorne and Alonso gradually climbed the timesheets to end up eighth and ninth respectively. Carlos Sainz Jr, in the second Renault that features upgraded bargeboards, rounded out the top 10 - 1.398s off the pace and just 0.022s quicker than the lead Toro Rosso-Honda of Brendon Hartley. Sainz escaped a brush with the wall with his right rear towards the end of the 90-minute session. Hartley's time was set on his first set of hypersofts, as on his second he glanced the wall exiting Sainte Devote on his first flier and did not subsequently improve. Force India duo Sergio Perez and Esteban Ocon were 12th and 13th ahead of the Toro Rosso of Pierre Gasly, who set his best time on his first set of hypersofts. Williams driver Sergey Sirotkin rounded out the top 15, followed by Haas driver Kevin Magnussen and Sauber's Charles Leclerc. Every driver set their fastest lap using hypersoft Pirellis.